Another weekend, another pole position. 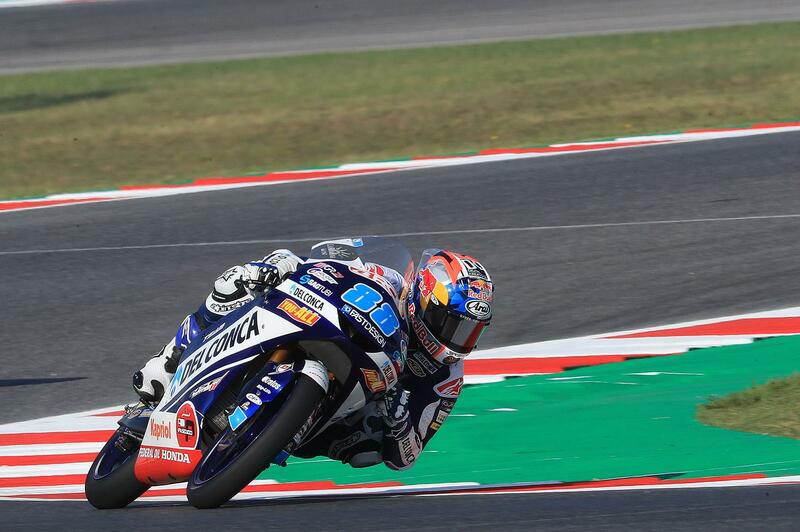 Jorge Martin secured his 17th Moto3 pole in fine style at the San Marino GP, smashing the lap record at Misano by 0.324 to spearhead the lightweight class grid behind enemy lines, with Gabriel Rodrigo 0.311 behind the Spaniard in second and Aron Canet in third – the Honda rider jumping up the timesheets on his final run. Blue skies greeted the Moto3 grid for qualifying and the pace was scorching from the outset, with Italians Marco Bezzecchi, Leopard Racing’s Enea Bastianini, teammate Lorenzo Dalla Porta and Fabio Di Giannantonio challenging for provisional pole, before Rodrigo went quickest shortly before tucking the front at turn one. 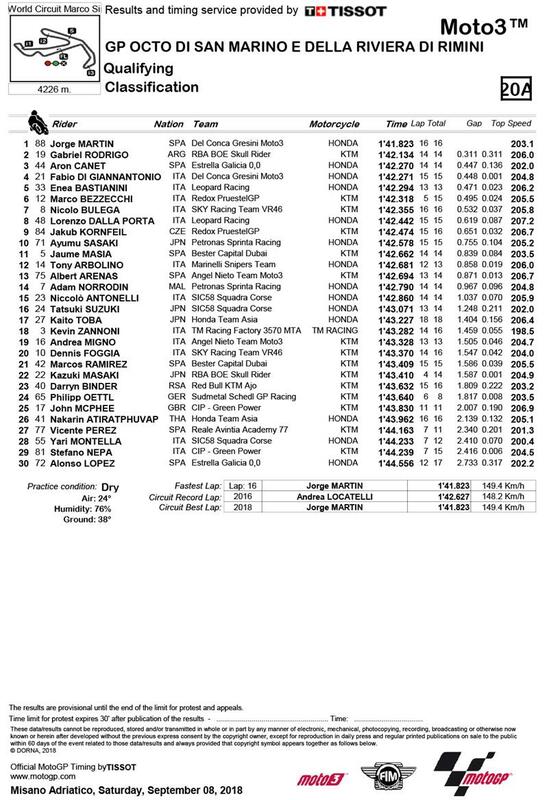 Behind the number 21 is a gaggle of home riders, led by Bastianini in fifth, with Championship leader Bezzecchi having to settle for 6th on board his KTM after looking very strong for a home pole throughout. Heading the third row is SKY Racing Team VR46’s Nicolo Bulega who went out in tandem with fellow VR46 Academy riders Dennis Foggia and Bezzecchi to try and find the fastest lap time possible, with seventh for Bulega in the end. Dalla Porta lines up alongside his compatriot in eighth, with Jakub Kornfeil ninth after his fastest lap time was cancelled for exceeding track limits at the final corner – a second position on the grid went beckoning for the Czech rider. Rounding out the top ten in qualifying was Japan’s Ayumu Sasaki. Jorge Martin is the 2018 Moto3 World Champion, taking the title at Sepang after a stunning season.